Have you ever wondered why you are seeing so many pop-ups when you browse the Internet? 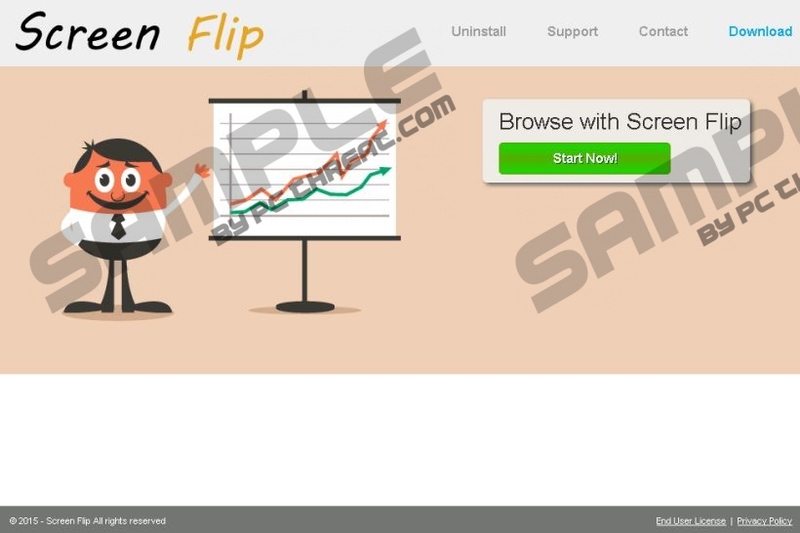 You are most probably infected with Screen Flip, an adware application. This program may not cripple your computer immediately, but if you do not remove Screen Flip right now, the program could end up being exploited by cyber criminals. Scroll down to the bottom of this article for the manual removal instructions, and please do not hesitate to invest in a licensed antispyware tool in order to safeguard your PC against similar infections. Your computer’s security should be your utmost priority. Luckily, Screen Flip is not an extremely dangerous program, and we know quite a lot about it. When you know enough about a potential computer security threat, it is a lot easier to remove it. So Screen Flip is part of the SuperWeb family. That makes the program identical to Write Results, Intense Results, Record Page, and many other programs that have been released over a period of time. All the applications from this group are known to have their own official websites. Screen Flip also has a homepage at myscreenflip.com. However, this website cannot and does not provide us with anything new or useful. The download button on the front page does not even work. On the other hand, that is not surprising because the SuperWeb family adware applications are mostly distributed in software packages. Therefore, it means that you downloaded and installed Screen Flip yourself when you downloaded some freeware app from a file sharing website. It is important that you exercise safe web browsing habits in order to avoid Screen Flip and similar intruders. Whenever you are about to install some new application, please be sure to read the installation wizards steps carefully. Chances are, users are often informed about Screen Flip and other additional apps, but they fail to notice the messages because they are too focused on the rapid installation. As a result, Screen Flip gets installed on your computer, and it adds plug-ins to your default browsers. Our research experts suggest, however, that the newer Google Chrome versions block Screen Flip in order to protect your PC from potential threats. The fact that a reliable web browser blocks this adware app should be enough to convince you that you must remove Screen Flip right now. Please do not wait until the adware program bombards you with annoying pop-ups that are often embedded with unreliable third-party content. To protect your computer from harm, you have to delete all the potentially unwanted and dangerous applications immediately. Therefore, after the manual Screen Flip removal, scan your computer with a reliable security application, and remove all the remaining threats automatically. Click Settings on the Charm bar and go to Control Panel. Open Uninstall a program and remove Screen Flip. Select Uninstall a program and remove Screen Flip. Select Add or remove programs and uninstall Screen Flip. Quick & tested solution for Screen Flip removal.